EssentOne Fulfillment offers complete sales order fulfillment and shipping functionality that allows you to maximize the number of accurate orders shipped. EssentOne Fulfillment provides flexible and extremely accurate fulfillment and shipping tools appropriate for your business. Fulfillment of stock orders streams through your warehouse. Special orders are routine. Single-step fulfillment and billing is possible. Fulfilling and shipping complex orders that require synchronized and scheduled release becomes simple. For companies that demand 100% accuracy, EssentOne Fulfillment offers Verified Fulfillment. Through barcode technologies and Verified Fulfillment, shipping departments can decide on a product-by-product basis which items must be scanned to insure up to 99.97% fulfillment accuracy. EssentOne Fulfillment minimizes the time and errors associated with shipping. Through the optional integration with FedEx® Ship Manager™ and UPS® WorldShip™ shipping software systems, order information is automatically communicated between the carriers and you. Order information including customer name and address are automatically communicated to these third-party shipping software systems. After the packages are processed, package information, including actual weights, shipping charges, and tracking numbers are automatically communicated back to EssentOne Fulfillment. Fully integrated with the EssentOne suite of applications, EssentOne Fulfillment transactions are completely tracked and related back to orders, inventory items, invoices, and customer returns. Backorder management is automatic. Invoicing is automatically initiated from shipping. EssentOne even knows when to, and when not to, process orders due to customer credit issues. Generate Pick Lists by Sales Order. Fulfill partial or complete Sales Orders. Inventory is automatically reduced when item is fulfilled. 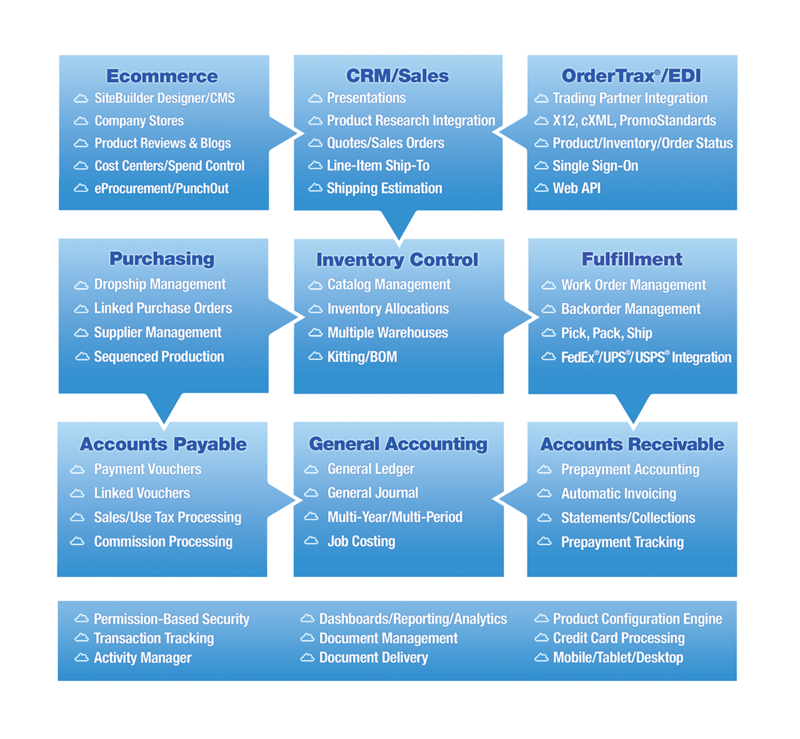 Integrated Credit Management prevents Sales Orders from being fulfilled or shipped for Accounts on Credit Hold. Track Shipments related to Sales Orders. Ability to enter per order Shipping Charges. Generate Work Orders for Orders containing Services. Enter descriptive Service Notes and Actual Time for each Service item contained on Work Order. EssentOne Fulfillment is modern. EssentOne Fulfillment automates the error-prone and time consuming fulfillment and shipping tasks, providing you with the time to complete the maximum number orders in the minimum amount of time. From the simple sales order with a few stock items to complex sales orders with multiple stages requiring synchronized delivery of products and services, EssentOne Fulfillment takes the guess-work, verbal communication, and expertise out of the process. Orders are accurately fulfilled, backorders are minimized, and in the cases when they do occur, tracking and fulfilling backorders is repeatedly and seamlessly handled as a regular part of the fulfillment process. All critical shipping information is captured and recorded, even from major third-party shipping software systems. EssentOne users and customers have critical tracking shipping information available at their fingertips. Fully integrated with EssentOne Accounting, EssentOne Customers, EssentOne Inventory, EssentOne Web StoreFront, and the EssentOne Operations Management System, EssentOne Fulfillment streamlines the major shipping activities. At every step of the distribution process the company will know what products and services were fulfilled where, when, and why, including how and how many were shipped. The company and customers will have the right answers at the right time -- exactly when they’re needed. Distribution problems decrease as fulfillment accuracy goes up and the time to identify and correct problems goes down. Costs decrease as fulfillment time, rework, and incorrect fulfillment are decreased. Customer satisfaction is increased as order accuracy, speed, and information increases. All product and service information is logically organized and available at your fingertips, providing the information needed for accurate fulfillment. Inventory control technologies like barcodes and barcode scanners optimizes the fulfillment process. Getting started with Essent is easy. Contact us today to begin the process. An Essent representative will work with you, at no cost, to begin the process of developing a solution tailored.